In making a decision to pursue medicine and healthcare as a livelihood, it is likely that most physicians today did not contemplate the extent to which legally binding contracts would govern and impact their professional lives. Few other careers carry the same potential for commitment to so much paper and binding agreements that simultaneously foster professional opportunities and create hazardous legal and professional risks (for example, a non-compete agreement that bars future employment needed to avoid selling the house and moving; a contract with a hospital system that memorializes a compensation arrangement but, unbeknownst to the doctor when he signs, violates STARK law). In this day, all physicians should be mindful of the critical importance of good contracting principles and practices. The healthcare industry, perhaps more dramatically than other industries, is prone to changes, trends, and developments. A sustained trend has been physician employment (versus private practice ownership). In the 1990s, with the evolution of HMOs, the industry trended toward high levels of physician employment, a trend that petered out some during the 2000s with decreasing physician employment as HMOs dissolved. In recent years, however, the healthcare industry returned to a strong trend toward physician employment driven by numerous factors derived from healthcare “reform.” Whether the current physician employment trend is more permanent than the last one is unknown, but some experts predict that the high level of physician employment is here to stay. As reported last year in the Dallas/Forth Worth Healthcare Daily, some experts believe that physicians’ need for stability with regard to future income will drive a lasting employment trend. 92% of physician placements in 2015 were as employees. Primary care physicians topped placement: more than 35% of all placements in 2015 were primary care physicians. Placement of American Medical Graduates reached a new high of 71.43%. What is virtually certain is that, irrespective of how the healthcare industry trends, doctors signing contracts will continue. Employment contracts are the obvious, but only one, example. Unlike other professional jobs, almost all physician employment by a significant employer will be pursuant to a physician employment contract. Often a physician’s first exposure to this reality (of having to sign contracts) is his/her first job. 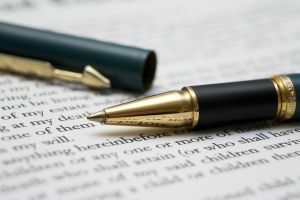 Some physicians assume — usually incorrectly — that the physician employment agreement presented to them is “standard” or otherwise a take-it-or-leave-it deal with regard to its terms and wording. If the essential considerations are acceptable to the doctor (pay, location, etc. ), the contract is thus too often signed without careful analysis or, alas, a complete reading. That is a mistake, one that can be painful down the road if the employment relationship sours over time or is terminated unexpectedly. No contract should be signed without understanding it and, where the other party prepared it, securing at least modest wording changes to ensure essential terms are conveyed in mutually fair, reasonable language that advances each party’s (not just the hospital’s) interests. Because physician employment agreements consistently deal with the same, above-stated (and similar other) topics, from 1000 feet many physician employment agreements seem to look the same: they are long, have lots of words and legalese, and address what seem to be the same points. What is often easily missed by superficial review of a physician employment contract — but is potentially critical to a physician’s future — is interplay between such provisions based on how they are cast in a particular contract. For example, an employment agreement under consideration by a doctor may provide that the employer pays for tail coverage (a meaningful expense physicians prefer not to have right after employment ends), then provide (fifteen pages later) that in the event the physician terminates the agreement “without good reason” (a term defined eight pages earlier) that in fact the physician must pay for tail coverage. At the same time, another provision (buried elsewhere in the 30 page document) may provide that in the event the physician fails to obtain the tail coverage and timely provide documentation thereof to the employer that the employer may buy such coverage and set off the premium cost against any salary or bonus owed to the physician. How the “without good reason” section is worded — as to precision, clarity and mutual fairness, in particular — are thus important to the physician that desires not having to write a check from a tail coverage premium just after the job ends. There are dozens of other examples of how particular provisions of a typical physician employment agreement interact. Prudent, business-minded physicians should assume that they will need to sign many contracts over the course of their careers, including managed care agreements, partnership and other agreements for medical practices and various joint ventures, medical equipment leases, medical office leases, employment agreements for staff, billing company contracts, and many others. Every contract matters in very significant ways and should be carefully considered. If you have questions regarding this blog post, a contract issue or dispute, you may contact us at (404) 685-1662 (Atlanta office), (706) 722-7886 (Augusta office), or info@hamillittle.com.